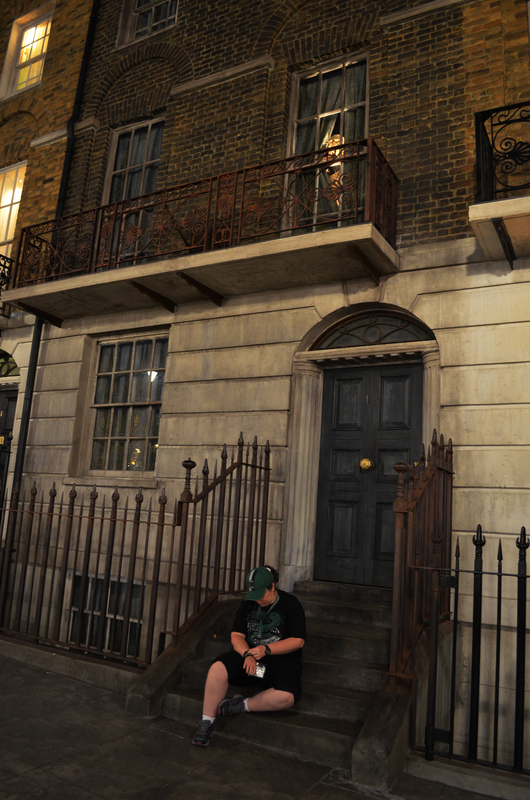 “Don’t talk rubbish. There is no platform nine and three-quarters.“—Vernon Dursley, Harry’s uncle. 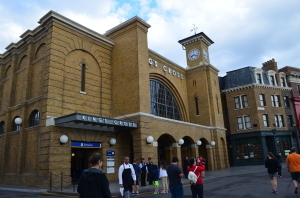 King’s Cross Station in London- or for us Yanks on this side of the pond, King’s Cross Station in the London section of The Wizarding World of Harry Potter at Universal in Orlando, FL is where you can find it here in the states. 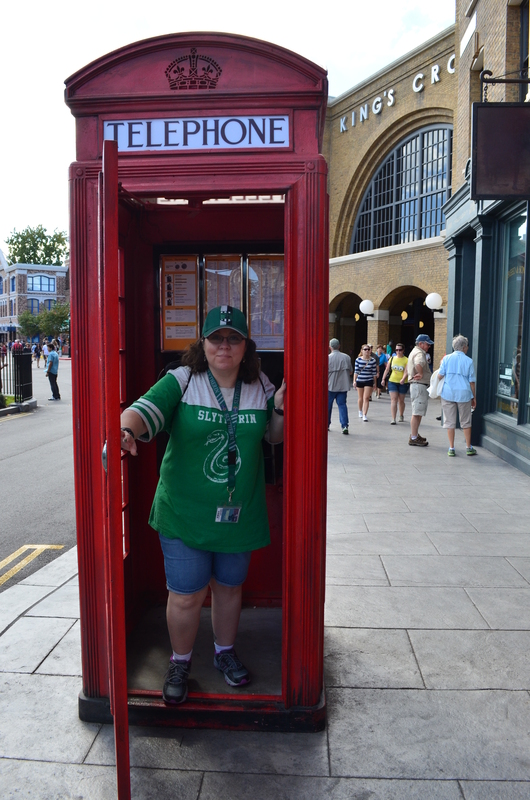 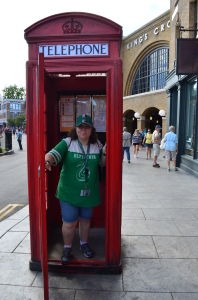 You have to walk past it on your way to Diagon Alley (be sure to step inside the phone booth to hear a message from the Ministry of Magic). 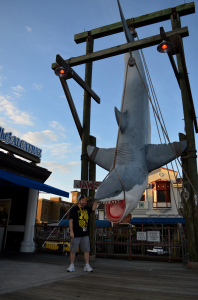 It’s just past the Fisherman’s Wharf area of the San Francisco section of the park that has the hanging JAWS shark. It’s not too far from The Transformers, The Simpsons, or Mel’s Drive Inn. Diagon Alley is actually located on the site of the old JAWS ride. 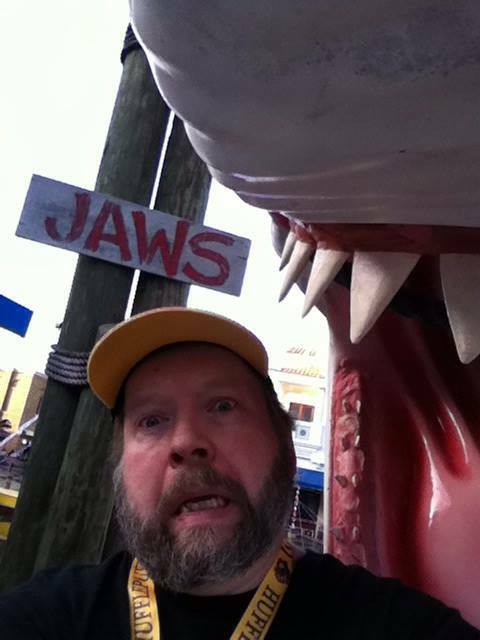 I really enjoyed the JAWS ride when I was there about 12 years ago, and it was good to see “Bruce” again. 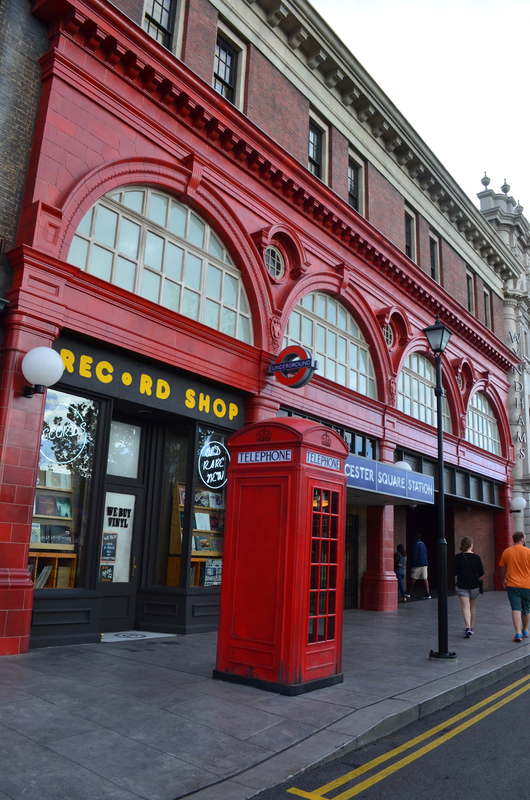 As much fun as it was back then, the new addition of Diagon Alley is just amazing. 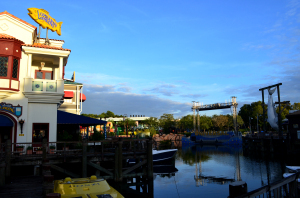 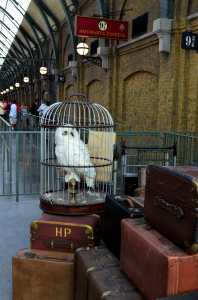 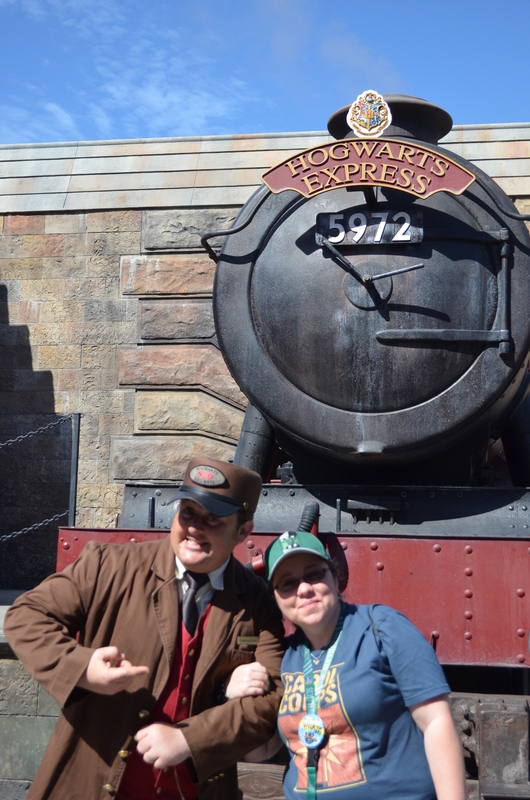 Now that it and Hogsmeade in Islands of Adventure are connected by the Hogwarts Express I hate to say I don’t miss the old boat ride. 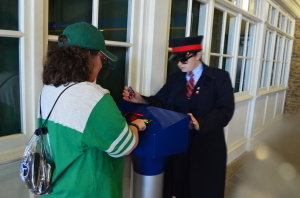 Unfortunately there was one park goer we passed as we were leaving who was in for some disappointment. “If we don’t get to go on the JAWS ride I’m never coming back here!” Uh, hope she liked Diagon Alley..! 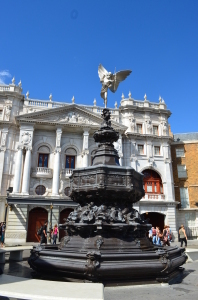 When we first got to the park on Tuesday we went straight to the “Escape From Gringotts” ride in Diagon Alley (you can read more about it here). 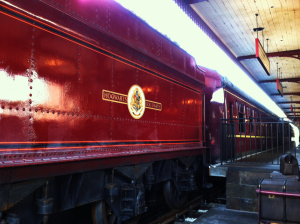 Later that day we headed over to King’s Cross Station to take the Hogwarts Express to Hogsmeade. 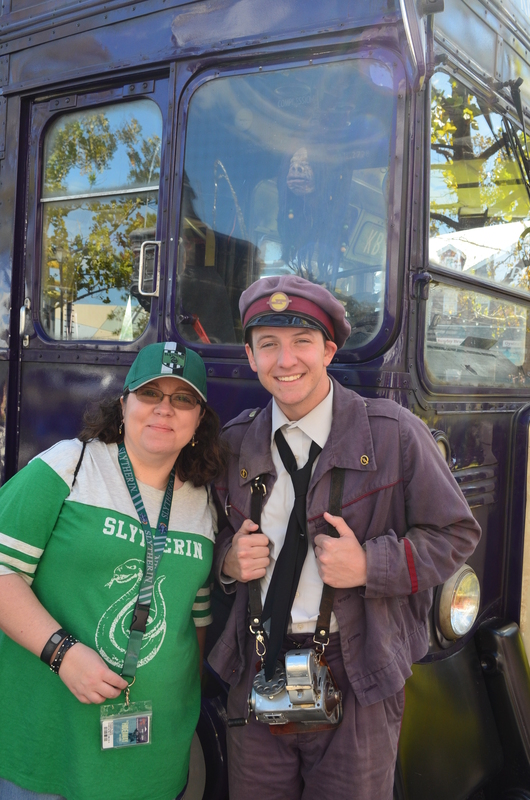 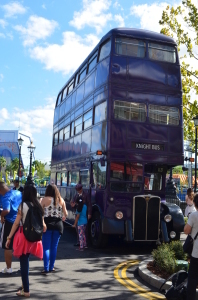 Before hopping the train to Islands of Adventure, we stopped to check out The Knight Bus and met conductor Stan Shunpike and the talking Shrunken Head. 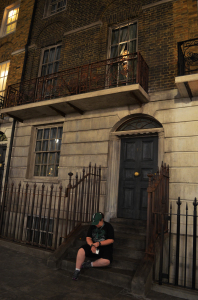 It was pretty cool, and parked across the straight from King’s Cross Station and 12 Grimmauld Place (the ancestral home of the Black family). 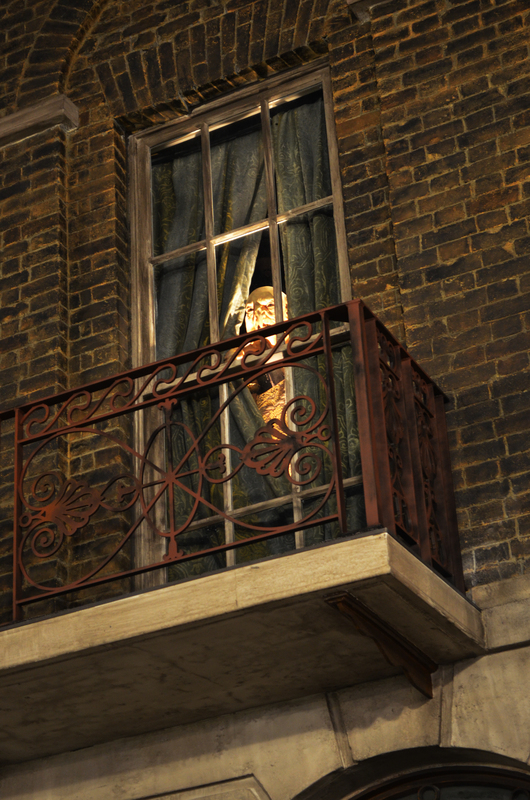 At night if you keep an eye on the upstairs window of 12 Grimmauld Place you may catch a glimpse of Kreacher, the Black house-elf. 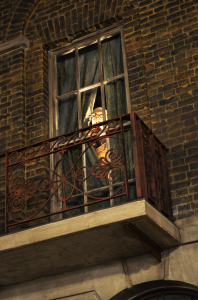 He pulls back the curtains to see who’s downstairs at the front door. 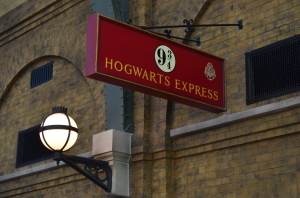 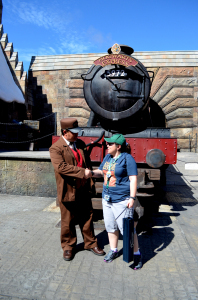 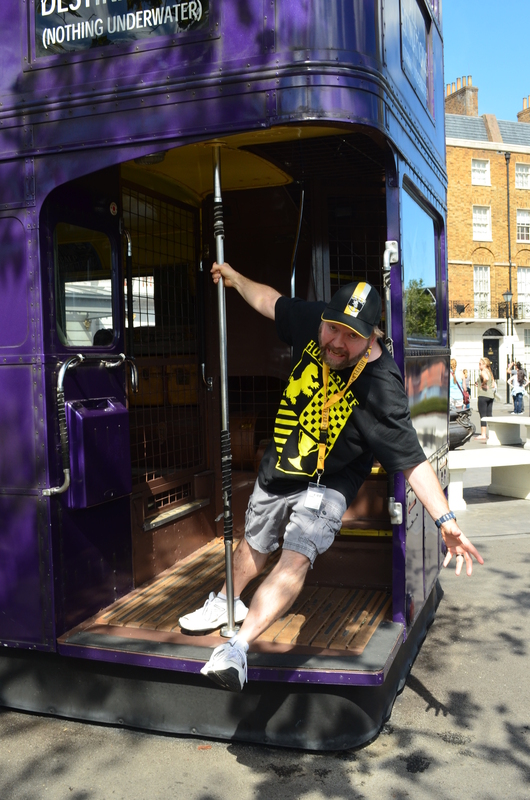 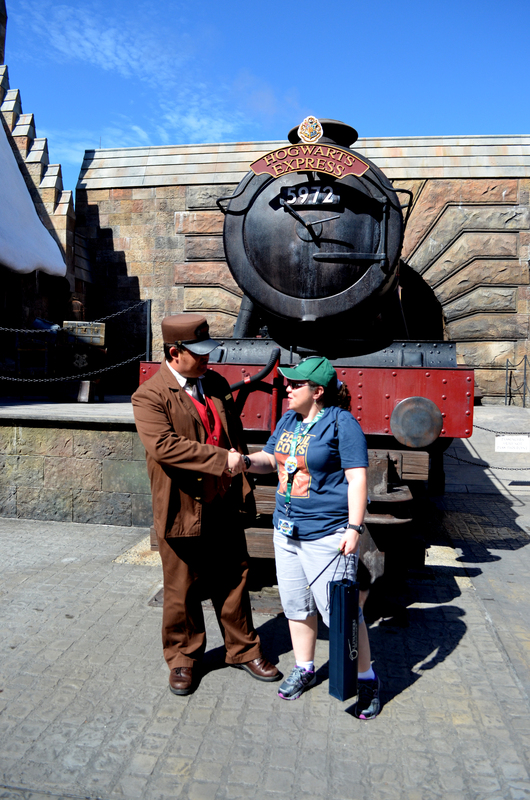 We walked into King’s Cross, presented our park passes, scanned our finger prints, and headed down the tunnel to look for Platform 9¾ and the Hogwarts Express – our magical ride to Hogsmeade and Hogwarts Castle– home of Hogwarts School of Witchcraft and Wizardry. 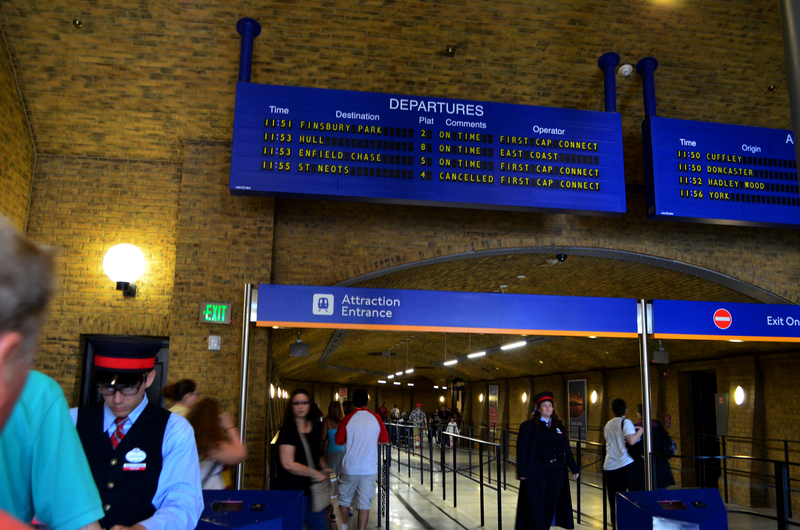 After walking the queue line through the station and snaking back and forth a few times we passed through to Platform 9¾. The first time we walked through the wall we didn’t even realize it. 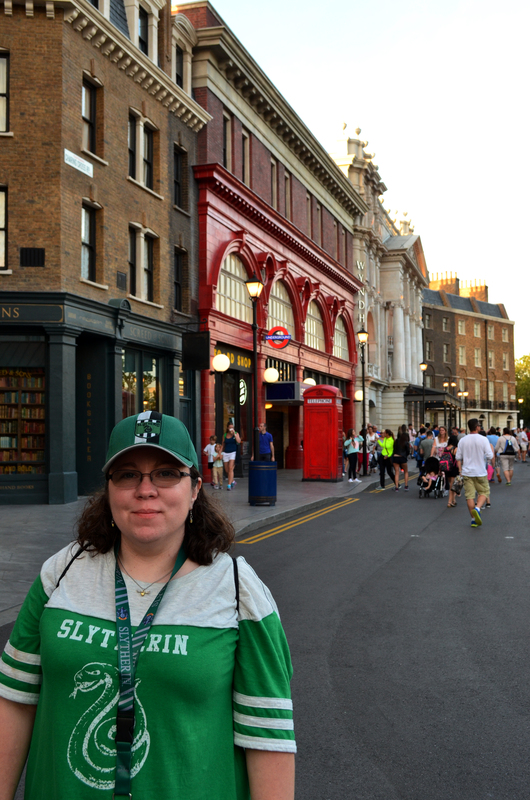 There weren’t many folks in front of us so we missed seeing the effect. 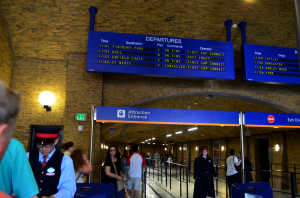 Our next time we saw someone taking a photo of someone passing through the wall. 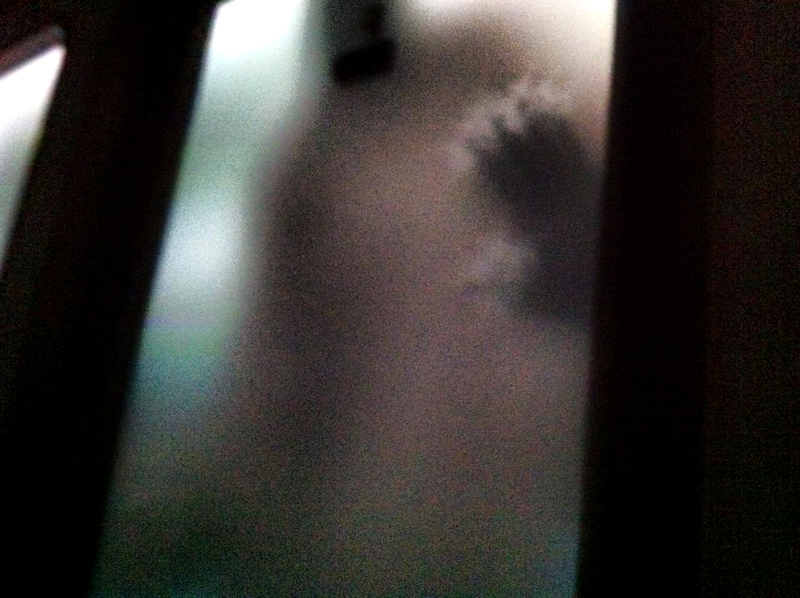 It’s a Pepper’s ghost type of effect. 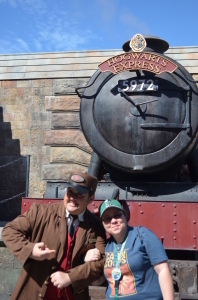 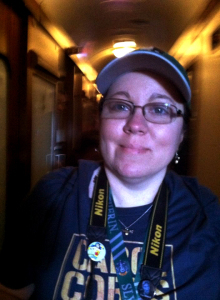 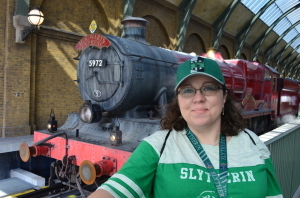 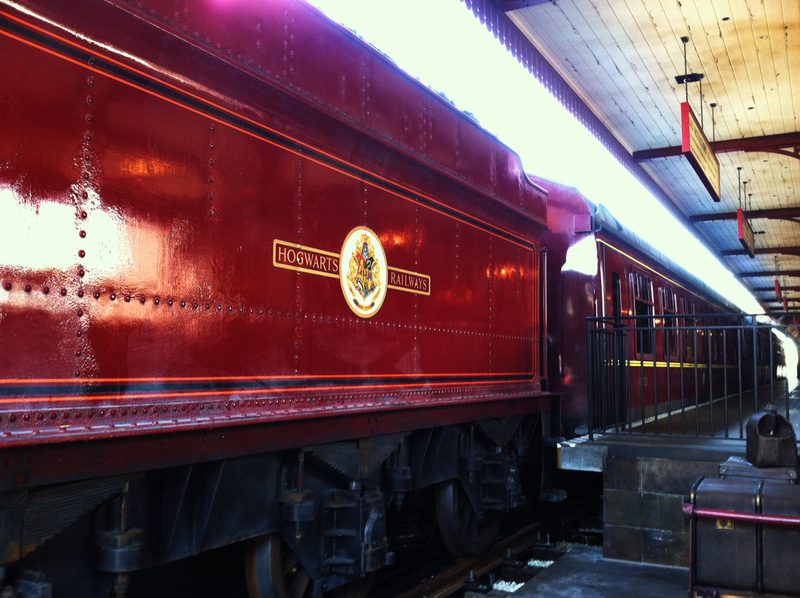 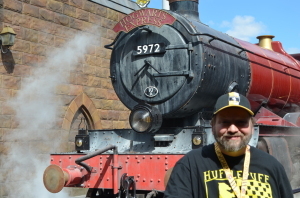 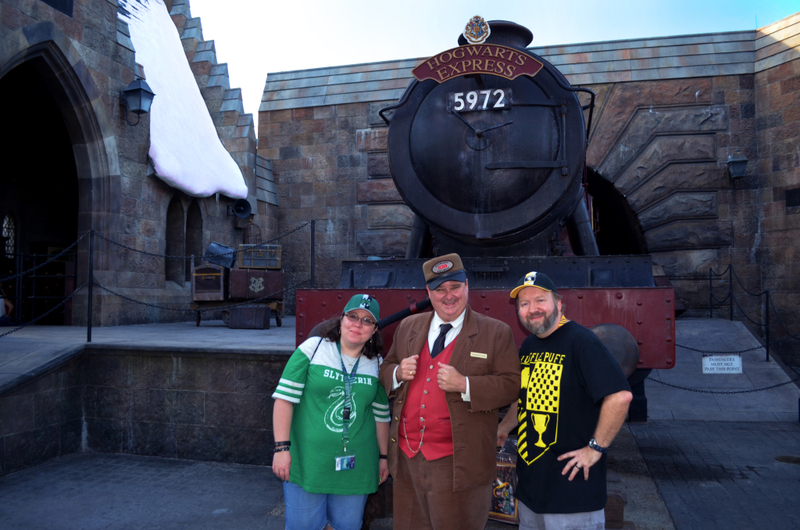 It was very cool, but seeing and hearing the Hogwarts Express was even cooler! 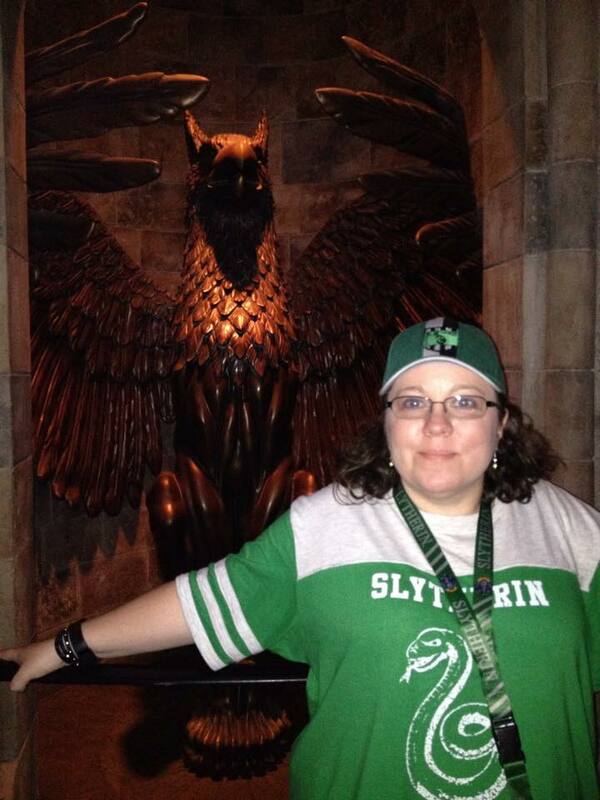 As you can tell by the photo above, my wife Nicki was a happy Harry Potter fan! The line moved fairly quickly and it didn’t take long for us to board the train. Once inside the train car it was another time we felt like we had stepped into the movie. 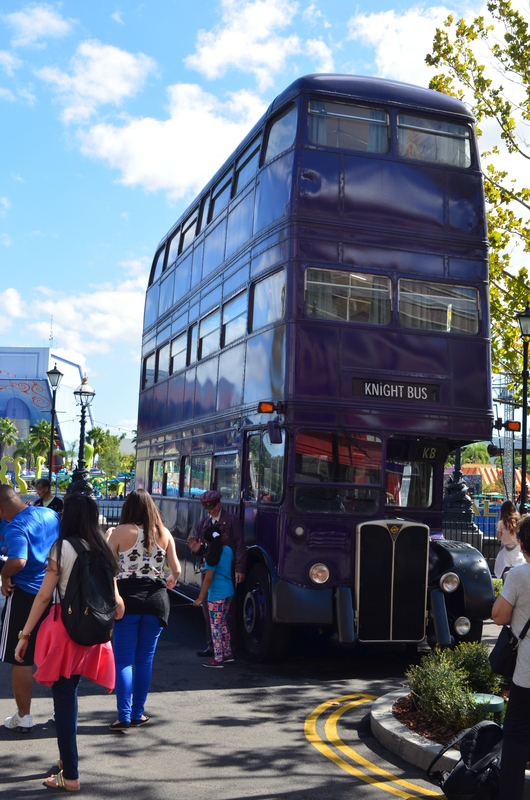 There were eight of us to a car- four on each side. 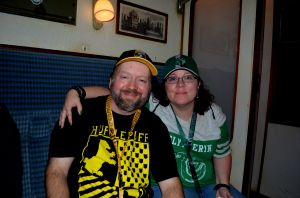 Each trip we tried to sit in a different spot. During the train ride we could see silhouettes and hear Harry Potter, Ron Weasley, Hermione Granger, and the sweets Trolley witch out in the hallway. We even saw chocolate frogs clinging to the other side of the car’s windows. 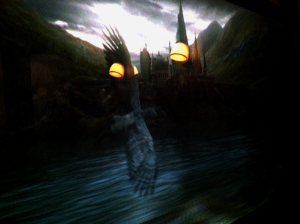 And then a Dementor showed up! 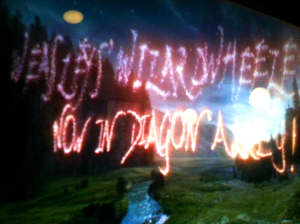 Lucky for us Harry knows how to produce the Patronus Charm. Fred and George Weasley– the Weasley twins, and an ad for their shop Weasleys’ Wizard Wheezes! 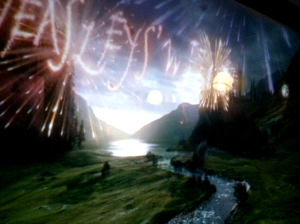 The view was different on the ride in each direction to and from Hogwarts. 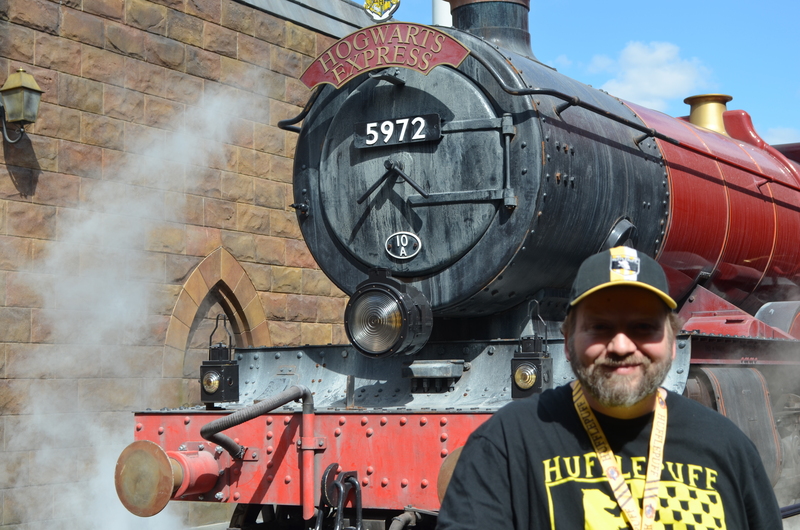 The trip seemed to take only a few minutes, but was extremely entertaining and the attention to detail did not go unnoticed or unappreciated. 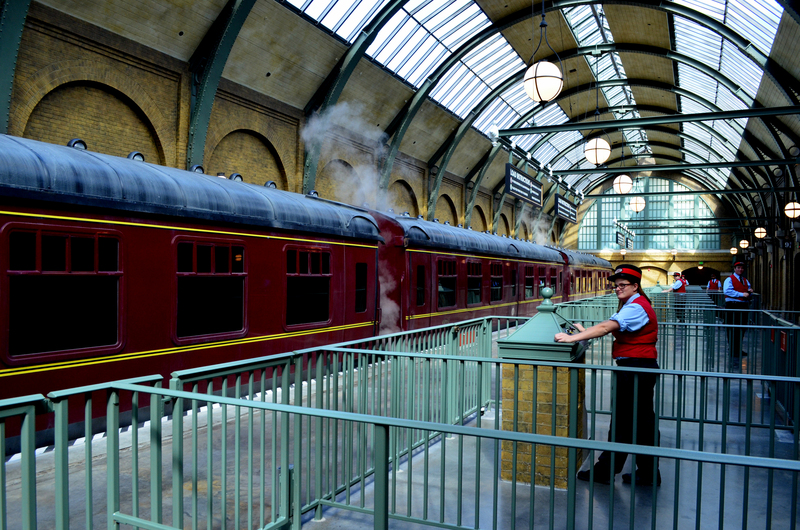 We had been waiting to take this ride for a while now, and it was definitely worth the wait. 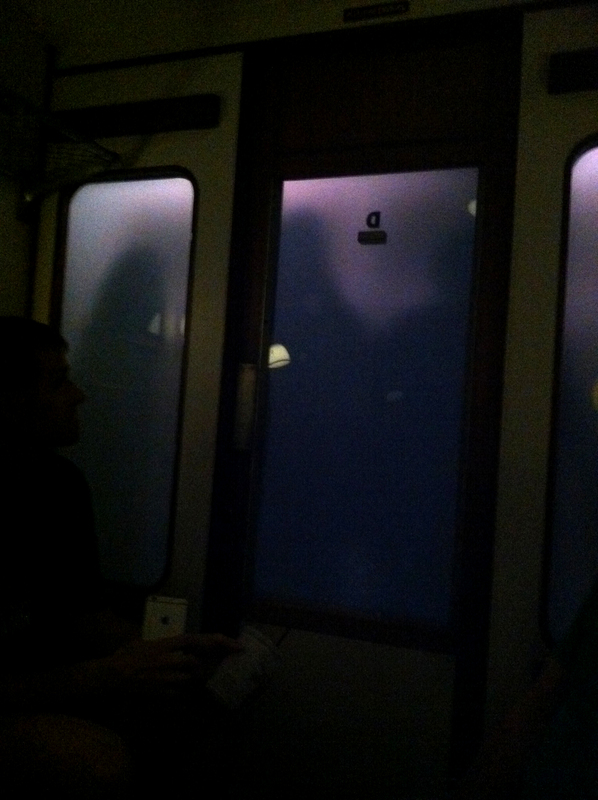 Really hope to be a passenger again soon. 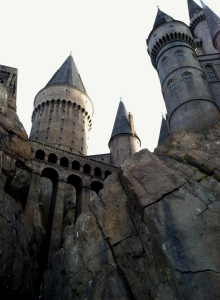 Next blog stop- Hogwarts School of Witchcraft and Wizardry.